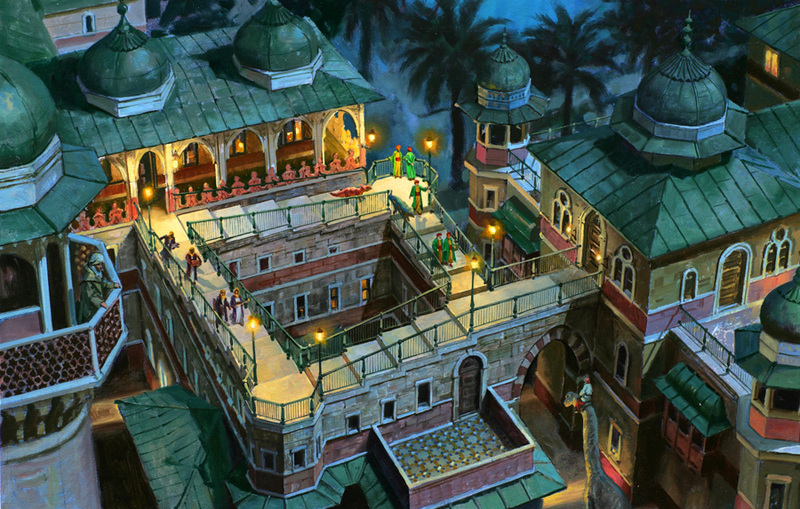 When I painted this Dinotopia image I wanted to do my own spin on the famous "infinite stairway" optical illusion invented by Lionel Penrose and M.C. Escher. If you walk around the stairs clockwise, you proceed infinitely downstairs, and if you walk counterclockwise, you go upstairs forever without gaining in altitude. "Scholar's Stairway," Oil on board, 12 x18 inches. The way I painted it, the illusion is fairly subtle, and I wondered if other people even noticed the illusion, and if so, whether their eyes moved systematically around the stairs. To find out, I asked vision scientist Greg Edwards, president of Eyetools, Inc., to run some eye tracking tests using this image as the subject. Dr. Edwards had fifteen subjects look at my pictures on a computer screen for fifteen seconds each while a sensor tracked their eye movements in real time. Below is the eye track of one subject's experience. The colored line shows the pathway of the eyes, beginning randomly at the green circle. The numbers in the black squares show where they eye traveled at each second of the fifteen second session. One can’t know for sure without a follow-up interview, but evidently this particular observer didn’t notice the optical illusion. 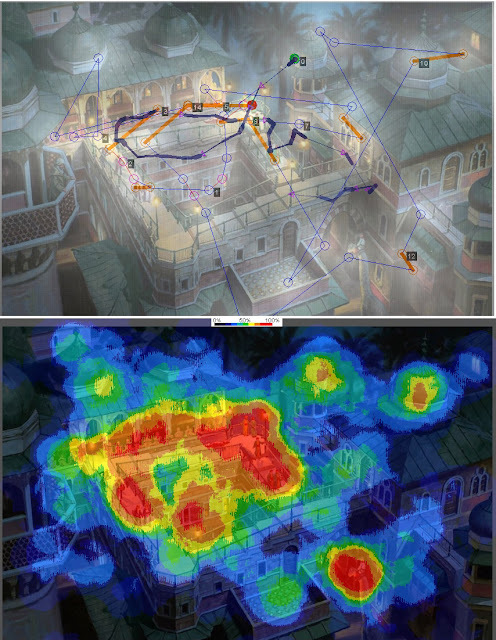 The second image shows the "heatmap," which aggregates data from all fifteen observers. The red and orange blobs are the areas of the image received nearly 100% of people's attention. The rider on the brachiosaur took attention away from the central illusion. The dark blue and black areas received almost no attention. What can we conclude from the heatmap image? Viewers definitely looked at the figures, wherever I placed them. Beyond that, we can't say much because we didn't design a very thorough experiment. I would love to work with a larger sample size and to gather followup interview data, and ideally collect simultaneous fMRI data set to see if we could correlate cognitive behavior with eye movement. That way we could understand better what happens when people "get" the illusion. If there's any vision scientist who has the equipment and wants to try an experiment like this, please contact me. This original painting is in the "Art of James Gurney" exhibition at UARTS museum in Philadelphia through November 16. Wouldn't a human or animal figure in any illustration always trump architecture? So, this data seems to suggest that if you wanted to have the illusion as the focus, I think maybe it would have to be life-form-free. Escher's stuff was almost always life-form free, right? Or, am I remembering wrong? Probably. But his work, in my mind, doesn't really seem to be about the animate form. It's puzzle. Kinda like Agatha Christie novels: the puzzle is the thing. It would be interesting to ask (after they had sat the test) whether the subjects were aware of the original Penrose Steps illusion beforehand. I'm with Susan in that I think narrative (human figure/animals) overrides other considerations in an image. I also think that you'd need to be primed that you're looking at a puzzle. It's very difficult to see something you're not expecting ( see Selective Attention on YouTube ), which is not to say you can't, but the 15 second viewing seems short to discover an anomaly, try to resolve it, fail, and thus realize it's an illusion. Especially when competing with a narrative which itself needs integrating into the puzzle. In the movie "Inception" the characters walk around such a staircase discussing it's illusory nature ( narrative and puzzle in one blast!) but it's not until the final change of camera angle that the illusion breaks spectacularly for the viewer, and the logical impossibility becomes apparent ( see "part of the movie inception; penrose steps" on YouTube).